Conducted at the Beltsville Adventist School (Md. ), BACC, a community service center located in the Potomac Conference, sponsored free eye exams for 146 students from High Point High School, Martin Luther King Jr. Middle School and the Calverton and Vansville Elementary schools. A team of volunteer optometrists—some local and others from the Daniel Migael Foundation—conducted the exams. The foundation provided the necessary equipment, as well as free prescription lenses and frames. This project started last fall, after conversations between Potauaine and principals from area schools. “The principals said they thought many students from low-income families were struggling in school because of vision problems,” explains Potauaine. “Principals also noted that there were some families who probably couldn’t afford vision exams or glasses. I was aware of the Daniel Migael Foundation and began working with them to see if it would be possible for them to come to the Beltsville area.” The school principals then identified students for vision testing and encouraged them to take the free eye exams. 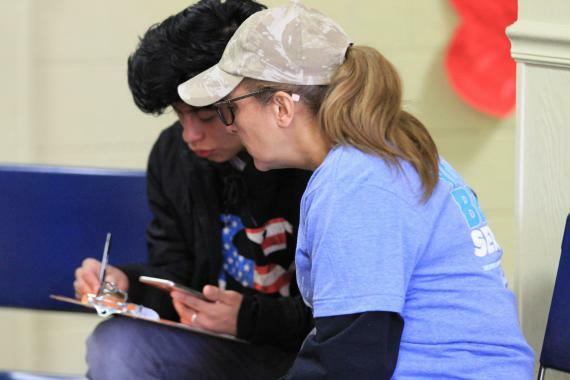 More than two dozen volunteers helped coordinate the project to ensure smooth registration and a stress-free exam. BACC opened in the fall of 2012 and is located directly behind the Beltsville church at 4220 Ammendale Rd. The center serves the community by providing food and rental assistance on a case-by-case basis. Free computer usage for employment search is available, as well as assistance with updating or reviewing resumes, grievance and prayer support, job counseling and other needed emergency assistance. In addition, the center has a county social services agent on site each day to help people with resources, such as food stamps, medical assistance for families, housing needs and special needs for senior citizens and those who are blind or disabled.